In the far-off year of 2005, VR rules. Will Singleton (Smith) is a man obsessed with VR. He even has a VR job and a VR girlfriend. His job involves working the bugs out of a “Virtual Reality Prison”, where prisoners are forced to compete in VR games against “wealthy sportsmen”. The mastermind of the VR prison system is one R.D. Crowley (Davi). Because he believes one of the VR prisoners might be innocent, Crowley throws Singleton into the game with the other sportsmen. These games involve going into various different historical periods and trying to survive. There’s even a madman on the loose, Baracus (Washburn). Will Will Singleton make it back to reality...alive? In the 90’s, VR was huge. It was surely slated to be the next big thing. 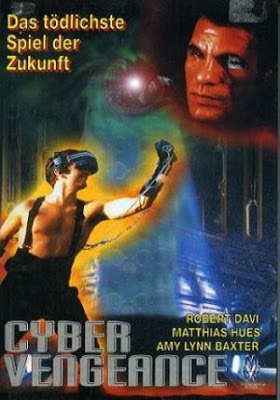 Many movies have utilized the VR concept, such as Expect No Mercy (1995), Evolver (1995), The Protector (1999), and even more mainstream fare such as Johnny Mnemonic (1995) and Virtuosity (1995), and the TV show VR Troopers, among many other examples. Here, Ingvordsen, the man behind Comrades In Arms (1992) and The Outfit (1993), assembles a sort of cross between an “unstuck in time” kind of adventure and a Most Dangerous Game (1932) knockoff. With silly morphing effects and characters running around with straps, suction cups and VR helmets, of course. In fact, the name of one of the makers of said helmets, “Headgear”, whose name is prominently displayed on the outside of the helmet, doesn’t really make someone look tough. It makes you think of complicated braces. The movie starts off with a bang, with Matthias Hues and other loinclothed fighters squaring off in what has to be one of the most ridiculous battles yet filmed. It’s rare to see something THIS silly THIS fast, and surely that makes this movie worth every penny. Before you can say “Start conscious Shareware”, the action continues in Revolutionary War times, the Prohibition era (which seems very much like Ingvordsen’s other movie, The Outfit), WWII, Vietnam, and other time periods. Frankly, it all gets a bit disjointed and jumbled, as you don’t know what time period, or what part of reality, the action is taking place in. But the team of Weiner, Washburn (who REALLY looks like Mike Huckabee) and Ingvordsen did it all on a low budget, and we commend them for that. As far as those actors are concerned, Ingvordsen and Josh Mosby look almost exactly alike, which is the same problem we had with The Outfit, in which they both co-starred. Plus Ingvordsen’s accent is just incomprehensible, seemingly going from Scottish to German to no accent in the course of one sentence. Washburn portrays Baracus (not to be confused with Brakus), but he must be the brother Mr. T rarely talks about. Rather than just sit at your computer and have a nice relaxing game of Snood, Sim City or Myst, we now have high-stakes VR. But it all has funny sound effects, and everyone where Will works wears the same Carhartt jacket. That’s the future for you. And there are some classic cliches such as the Black guy screaming while shooting a machine gun and the shrew of a girlfriend (in this case with the very 90’s name of Tori). But like how NASA, in the course of developing the complexities of the space program, brought us many other by-product inventions such as Velcro, so Cyber Vengeance does by inadvertently creating GoToMeeting. So that’s all well and good, but there are a few problems to spoil the fun. Contrary to the tagline of Absolute Aggression (a retitling or possibly a re-edit of this movie, we’re not really sure), if you die in the game, you DON’T die in real life. If that was the case, the movie would be a lot more exciting. As it is, it’s just a bunch of middle-aged men playing video games. Robert Davi might kill you, but it’s not a direct cause of the game. Also, there’s very minimal Hues. He’s featured prominently on the artwork we have (for whatever reason, this was released on DVD under this title in Poland and Germany and seemingly nowhere else), but it’s practically a cameo. 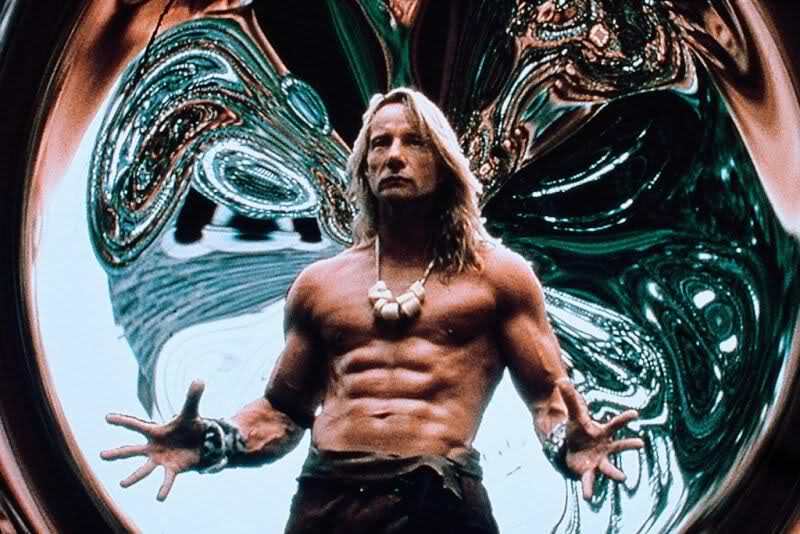 You’d think Matthias Hues portraying a hulking brute named “Thor” would be the role he was born to play, but sadly it’s cut pretty short. Plus the ending is highly unsatisfying. So all in all it’s kind of a mixed bag. So while there are some good ideas here, and it’s great a movie which takes place over numerous historical periods was made on such a low budget, it seems Cyber Vengeance - of which there’s minimal vengeance, by the way - would be of interest to buffs of 90’s nostalgia, and few others. I love a good 90s "cyber" movie. Will be checking this out for sure. Great review guys, keep up the good work. Thanks! We appreciate your support. This has a ton of silly cyber moments. Needed more Hues though. I have the Polish DVD and I just got through watching this and I thought it was enjoyable, despite the low budget, the cliches and the abrupt ending. 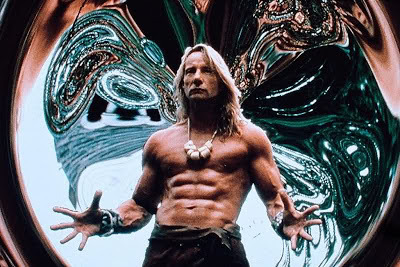 And yes, more of Matthias Hues would have made the movie a lot better. Still, it's a decent outing from Ingvordsen that I probably would watch again. This was in fact, released on VHS in the U.S., but it's out of print now and people like to sell used VHS copies of the film for a lot of money. In fact, one time I saw a used copy being sold for almost $1,000! Crazy! P.S. Absolute Aggression is actually a different film than this, despite sharing the same crew, some of the same cast, including Davi, and several similarities. I actually think that one is a lot better more energy-driven than this one and it is pretty easy to find on DVD. Thanks for your comment! Woah! 1,000 dollars! That's insane. Finally on US DVD! Thanks for the heads-up.